Fat Girl to Thin: Wedding Week, Beginning of Ball Season, and a 40th Birthday....Thats a Big Week!!!! Wedding Week, Beginning of Ball Season, and a 40th Birthday....Thats a Big Week!!!! Well so many things this week I just dont know where to begin. First off today was the official first week of CrossFit. (Since this blog is about diet and fitness I figure I should start with this one) I am still totally in love with this workout. I like the intensity, the combination of weights and cardio, the sweat and bruises and blisters, Im just loving it all. I have already learned I can do more than I was pushing myself to do. I want to be the best so I am pushing every day. And this week is also Wedding Week. 4 Days until my best college friend and roommate gets married. I have been looking forward to this for months and months. I want this dress to look great (I really just want it to zip!!!) and I want her big day to go off without a hitch. So with the wedding at the end of the week I was forced to say "NO" to an exercise in class this morning. I bruise like a peach already and he wanted me to do front squats and all I could envision was a huge line bruise across my collarbones. So I had to take a little less weight today so I don't have a huge mark on my chest. I don't care what my legs look like as long as the chest looks alright. Ok, so we are wedding week, still loving CrossFit, and the beginning of Basketball season, and my sisters 40th birthday. While I am running around with hair and nail appointments I don't want to miss any games since I will miss all of them at the end of the week and I have a huge 40th Birthday Celebration mid-week. Now, that I have unloaded my whole week on you, the week that hasn't even gotten started good yet, I can get to my day. 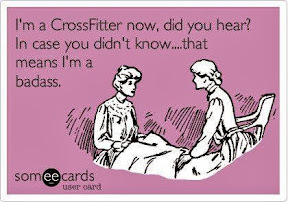 Lets talk some more about CrossFit. This morning in my class we did a lot of squat work. On Saturday I was finally able to move again with very little soreness. It finally didn't hurt to just exist. By this morning I was ready to go again and I am just hoping that I dont get that sore again (which I dont think I will) since I need to be able to walk down the isle and not limp. 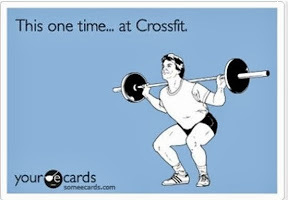 We did back squats and front squats, and lunges and toes to bar (ouch!) push presses. It was only 15 minutes but it was a crazy intense 15 minutes. After my workout I did a short run, maybe a half a mile and then 1000m row before hitting the shower and heading off to work. Since I am going to be gone towards the end of the week I want to make sure all my work is done. I got to the office early early and got right to it. After work I was off to some wedding things, mani, pedi, wax.... This is officially the last evening I have because of ballgames and birthday parties. I have beautiful nails and now am chomping at the bit for some basketball. I love basketball, I played and love to cheer for my babies. Middle school starts tomorrow and then high school shortly after that, and we are still in the middle of football season!!!! Its amazing, all my favorite sports going at the same time! I finally got home, later than normal, and have everything packed up and ready for tomorrow. My food also has to be on track this week. My dress was just barely zipping when I got home from vacation so I have to be better than my best to make sure this dress is zippable. I am rocking mostly a fruit and veggies diet this week, some juicing, some solids, and lots of prayer! Wednesdays Workout Made Thursday PAINFUL!